Legendary British heavy metal band Iron Maiden are preparing to release their first single in half a decade and have put together a video game-inspired music video to mark the occasion. Speed of Light's official video sees the band's iconic mascot Eddie getting sucked into an arcade machine which then forces him to play through four different gaming genres. There's a first-person shooter segment, a Mortal Kombat-style one-on-one brawler and a 2D platformer which combines elements of RoboCop with Namco's gore-filled Splatterhouse. 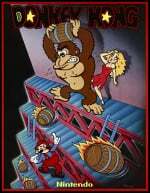 However, the portion of the video which will be of particular interest to Nintendo fans is a homage to Donkey Kong, where Eddie has to rescue a female character from a hulking bouncer, who takes her to the top of a building and then hurls objects at the undead rocker. Eddie takes down the flaming projectiles with an axe before smashing the ape-like bad guy with a TV set. Very rock and roll. Speed of Light is taken from Iron Maiden's forthcoming studio album, The Book of Souls. If you don't know who Iron Maiden are, ask your parents then watch this. I've never liked Iron Maiden,even when i went through my 'mosher' period.Always loved their album covers and posters but never really gave their music a chance,instantly dismissed them as 'cheesy' rock.I think it was because of my big sis telling a young and impressionable me that after her 'death rock' period finished and she turned into a mad raver. Ah. Iron maiden. Don't get enough attention these days. Loved their story telling lyrics like in The Trooper and Aces High. Fear of the dark is personal favorite. Up the Irons! Fantastic video! I hope to see them soon, I saw them two times in Bogotá Colombia, awsome band! Well the video's kinda cool, if very cheesy and 90s pop video dated looking, but the song is frikin terrible, imo. There's a hint of Metallica's Enter Sandman in there though, which is about the only decent part of the tune, to my ear. Fun fact, in a tribute to Maidens bassist, my cat is called Steven Harris. I got a Turok vibe from that last FPS segment, what with that T-Rex. Ok, weak connection at best, much like the rest of the video. The first segment was clearly DK, but well, enough that it was obvious, but then a little jarring with how loosely it followed the well known formula. The MK one followed the source material a lot more closely, even with what felt like a nod to X-Ray combos from the recent titles. The contra style shooter… couldn't really place a reference at all. With this kind of video, I think it's better to follow the reference material a little more closely. Like for the DK one: make the layout near identical to the original, include some barrel jumping. I mean, I get part of the charm is when Eddie breaks away from the game mechanics to cheat and win, but that only works if they follow the mechanics initially (hence why the MK segment works perhaps the best). i liked the visuals but i wasn't crazy about the song. also is there really a 2d sidescrolling shooter with no way to avoid bullets? I love Iron Maiden so it's great to see some Maiden news mixed in with game news. I love Iron Maiden. This song is definitely better than their last two lead singles (El Dorado was terrible). EDIT: I remember now! Its Freewheel Burning! Not sure if I got the game right.